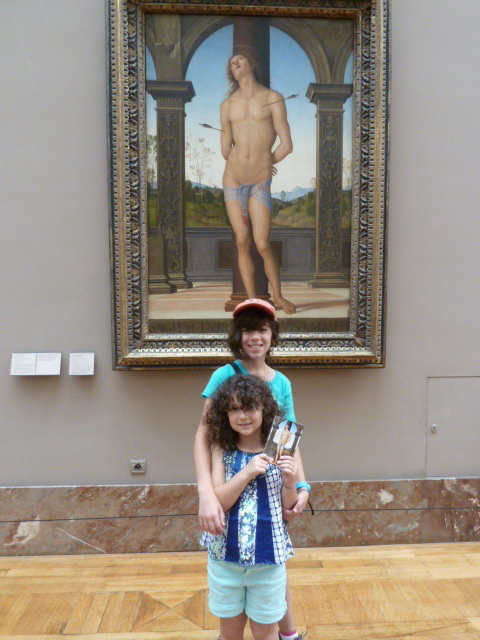 What better way to start off our Parisian adventure than a visit to the Louvre? We decided that we would do another scavenger hunt, and this time we found six out of the seven masterpieces pictured in the postcards the girls bought. Saint Sebastian was followed by the most overrated painting in the world, the Mona Lisa (“La Jaconde”) by Leonardo da Vinci. Don’t get me wrong, the guy was a brilliant artist and inventor. 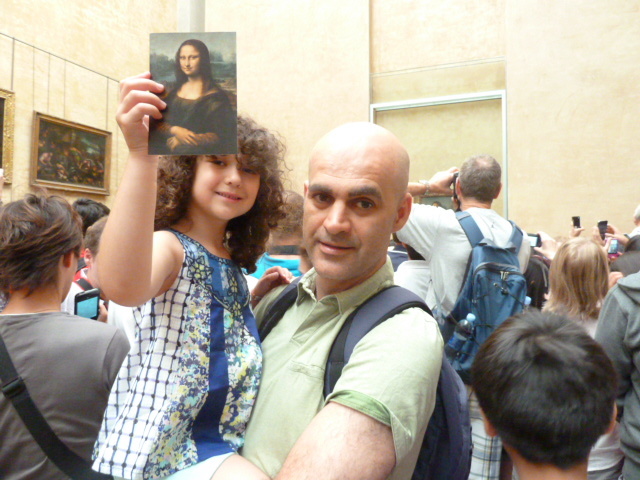 But the Mona Lisa simply isn’t worth the kinds of crowds we endured just to see a corner of it. 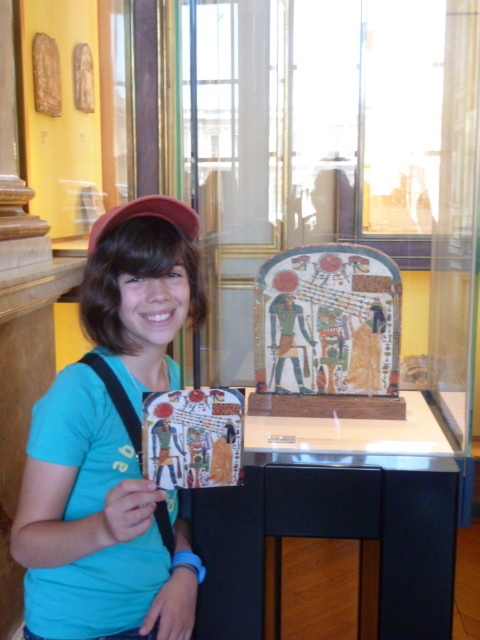 Chloe had been so excited to see it in person, but we couldn’t even get close. 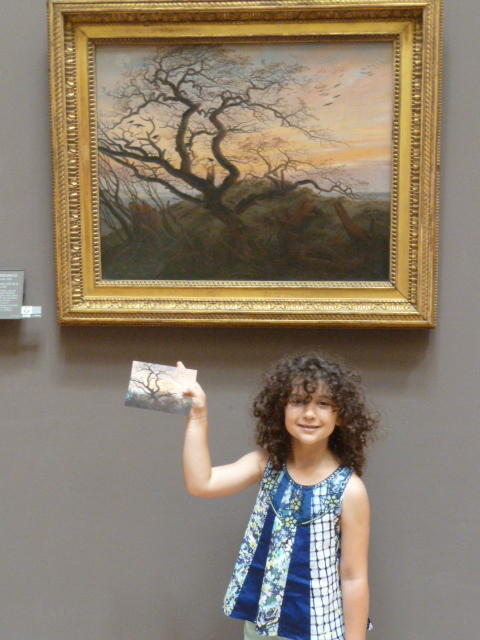 Since we had to settle for the small image in the postcard Sophie’s holding, you’ll have to settle for it as well. Ridiculous! 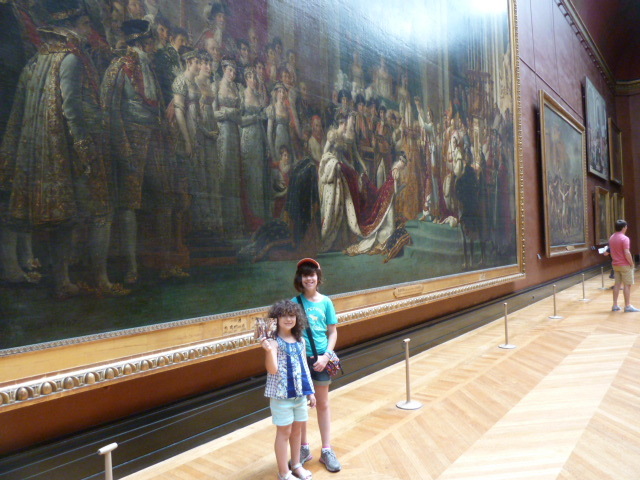 I explained to the girls that the painting on the opposite wall from where the Mona Lisa resides was a thousand times more worthwhile to admire. And hardly anyone was admiring it. That forgotten masterpiece is “Les Noces de Cana” by Veronese. After we finished with the Louvre, we had to get some lunch because Sophie was famished and cranky (hard not to be with the sea of people). 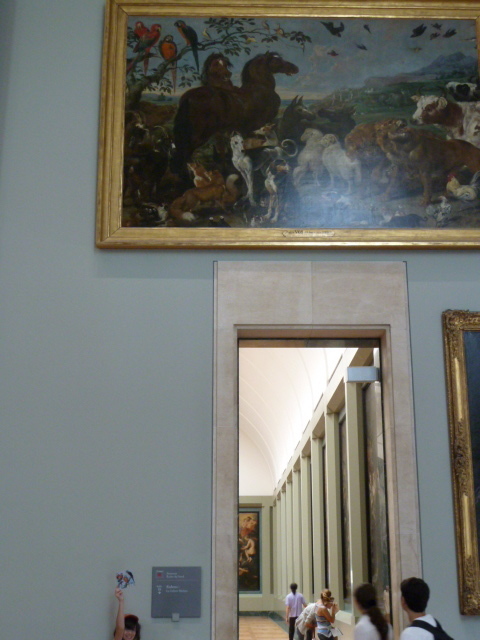 So we went to Le Carrousel du Louvre, the little shopping mall in the bowels of the museum – a place that first opened when I lived in Paris and which, at the time, had a food court offering relatively inexpensive eats. Not anymore, however! They completely upgraded the food court (with one notable exception – below) and it’s way too expensive, not particularly good and overrun by crowds. But there’s now a McDonald’s. And Sophie had lunch there. 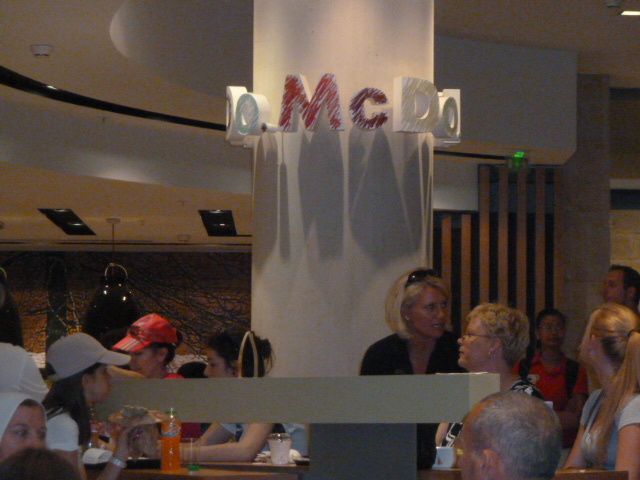 In the middle of the Louvre’s beautiful medieval foundation walls, there is now a chic McDonald’s. All that’s left for them to conquer is Mount Everest. And lest I forget the icing on the cake, peeing in a clean 1st class toilet, where they even sell souvenirs (yes, it’s true), will cost you 1 euro. Peeing in a 2nd class semi-clean toilet will cost you only 50 centimes. I am not joking. The toilets there used to be free. Boy, how times have changed. From there, we took a stroll in the Tuileries Gardens, which is home to a carnival during the summer months. Sophie and I took an overpriced ride on a ferris wheel, but oh, those views. 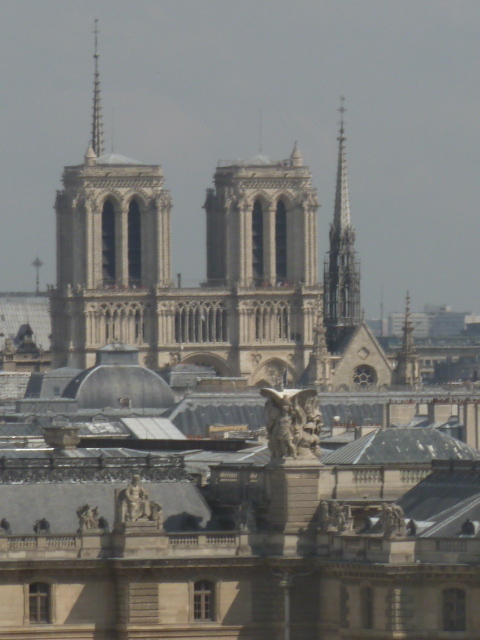 Worth every “eurocular cent,” as my darling Chloe would say.